I saw this picture and couldn't help but think of Thumper. I assume that you have seen Bambi (did you know it was made in 1942? I couldn't believe it). It's a classic and is jam packed with great advice for life. One of my favorite nuggets of advice comes from Thumper's dad. "If you can't say something nice, don't say nothin' at all." I cannot count the number of times my parents, my mom especially, repeated this phrase (and ones just like it) when I was growing up. I would probably be a millionaire if I had a dime for every time I've heard this phrase during my life. Then there's "what goes around comes around." Way back in the day when Cami and I started dating one of the things that impressed her the most about me was my ridiculously high self-esteem (when I was a teenager I would often say "it's not my fault God made me perfect") and self-confidence. I still believe with my whole heart that I can do anything I set my mind to. The problem is that I am also very lazy by nature. Not the best combination. Back to dating Cami. I also believe, and was shown by my dad, that you compliment and say kind things to those you care about. Thus, that is what I did with Cami. At the time she would deflect my compliments. For example, I would tell her that her hair looked nice and she would respond by telling me that it was because her friend had helped her. I am the opposite way. Pay me a compliment and I gladly accept it. That's right, I know I'm amazing and don't mind that you know it too. A little while after we were married I finally confronted her about it and told her that I didn't like that she deflected my compliments. They were meant for her and were from my heart. She needed to graciously acknowledge and accept them. It took her a few years with occasional gentle reminders from me before it became second nature to her. Now when I tell her that her hair looks nice she responds with something like "yes it does, doesn't it?" and a coy, confident smile. Victory!! The point is that what we say has a great influence on those we say it too. I have a friend whose elementary school teacher told her she was stupid. Guess what? She has struggled with that ever since. Tell your spouse you love them. Tell them everyday. Tell them several times each day. Let your wife know how beautiful she is. Share with your husband how intelligent you find him. Tell your children how special they are. Radiant kind words and uplift others with the things that you say. Remember Thumper's dad's advice, "if you can't say something nice, don't say nothin' at all." 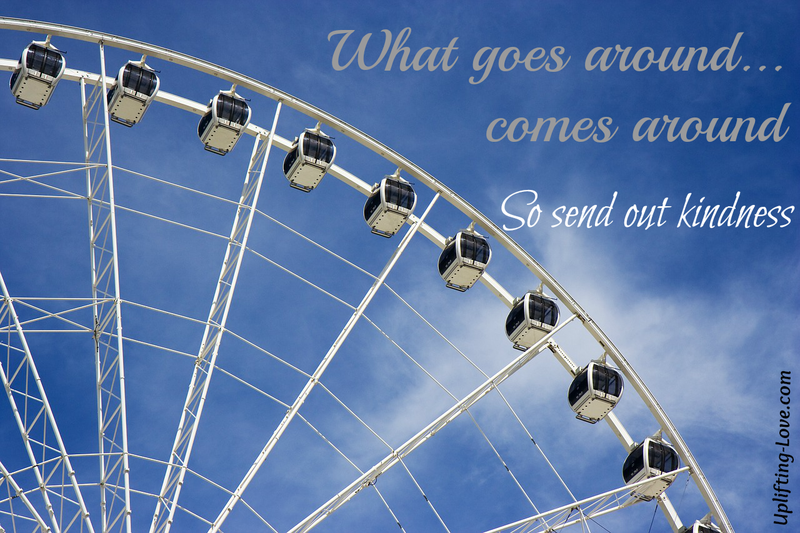 How does all of this fit in with "what goes around comes around" you may be asking. 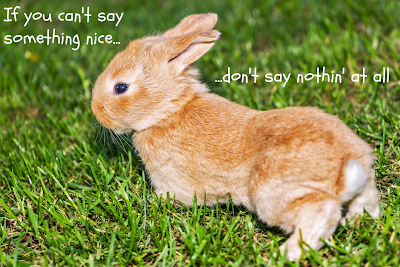 The more nice things you say to other people the more nice things get said about you. And it always feels good to have someone remind you how amazing you are.